Industry Weapon is offering applications and communication solutions for digital signage for K-12 campuses, mitigating areas where campuses lack fast, effective message broadcasting. With Industry Weapon's solution, schools create campaigns to communicate dynamic content to a larger audience than any previous form of messaging. From announcements to fun facts, students and faculty alike are more inclined to watch and retain information from the digital signs. Campuses can integrate directory and wayfinding applications for new students and visitors that need directions around the campus. Closed circuit television content can be transmitted onto the screens as well to broadcast live sports and school events. "Our solution greatly remedies communication issues by allowing administrators to transmit content quickly and efficiently across the entire district:, said David Wible, CEO, Industry Weapon. “From safety announcements that alert the district in emergency situations, to content approval processes that allow students to create messages under supervision, we've designed numerous applications with K-12 purposes in mind." K-12 institutions do not have their own Clery Act, which requires all colleges and universities to disclose information about crimes committed on or near campuses, Industry Weapon goes a step further for K-12 clients by providing the Alert Integration. 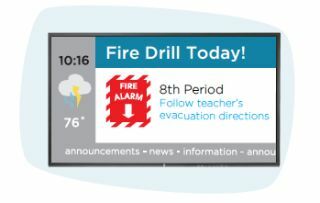 This integration connects with software such as E2Campus, Simplex Grinnell, and Blackboard for immediate emergency messaging notifications. In the event of a safety breach, inclimate weather, fire, etc., the digital signage displays an emergency warning until the emergency has passed. The digital media company also responds to the importance of test scores. For test-takers, digital signage enhances the standardized testing process by regularly providing them with simple preparation tips, broadcasting reminders of important test dates and times, and showcasing practice questions to familiarize students with the content. By creating campaigns that run during test days, students who are not being tested are informed of when to stay quiet in the hallways.